You might have a hard time finding this one but it should be part of your library interloan system. I love this whole series of books. This one won't tell you much about Richard III as king but it is a wonderful way to introduce shakespeare to kids. This handsomely illustrated series presents Shakespeare in such a lively and accessible manner that students and young readers will find themselves wishing to read all his plays. Readers learn to enjoy these immortal works as they follow the story, get to know the characters, and explore the historical background of each play. Packed with color illustrations and portraits of the main characters, and enhanced with quotations, these are eye-opening introductions for students as well as valuable tools for teachers. Know of a good Richard III for kids? Email me and I will add it. Although Shakespeare had a great passion for history, his plays were meant to be only dramatic, not factual. 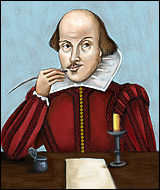 In fact, Shakespeare was the ultimate rumor spreader. He actually invented the word gossip, along with several other English words.